For many years the, unified communications (UC) and unified communications & collaboration (UCC) markets had been dominated by companies such as Cisco. These solutions have generally been thought of as costly and reserved for medium- to enterprise-sized organizations. Unless you’re employed by the Department of Defense, it’s likely that you’ve used the free version of Skype at work, and maybe even shared your screen. It’s okay—we’ve all done it. These days, “collaboration” is the new “connected.” You’d be hard-pressed to find an AV, IT, software, or telecommunications vendor that isn’t offering a collaboration solution in some shape or form. And now, giants Microsoft, Google, Amazon, and IBM are trying to corner the market. Whether your organization defines collaboration as having the ability to share files and manage a workflow, or audio or videoconferencing, collaboration can still be an expensive endeavor. So how do you decide which product suite or solution? Of course that depends on budget, organizational needs, a culture of change, and whether or not the tectonic plates of, AV and IT, have begun to settle into place within your organization. Most of the vendors noted below offer tiered solutions, from basic screen sharing, on up to fully loaded cloud solutions with video conferencing, multi-touch and more. Be sure to look at the offerings from each. The granddaddy of collaboration software is routed in project and workflow management. Its core strengths are in content management, file sharing and synchronization, content and conversation search capabilities, curated content delivery, and file storage. Team members collaborate on project files via chat, SMS, email, and sometimes screen sharing. 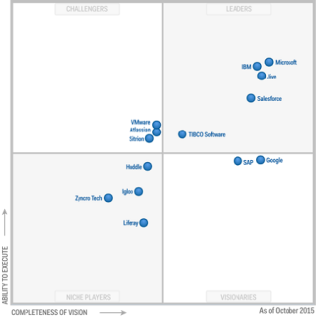 Gartner recently released its “Magic Quadrant for Social Software in the Workplace,” findings. Among other features, these products help users to collaborate, organize, discover and learn from others’ expertise. Microsoft, and IBM are among the five magic quadrant “leaders.” SAP and Google stand alone as the two, “visionaries.” You can read the full report here. The answer to “BYOD.” A number of vendors are offering presentation gateway solutions using screen mirroring software which enables content from multiple screens, from multi-platform laptops and mobile devices to be wirelessly presented at one time onto a display. These solutions are designed to be easy-to-use, with little training or tech support needed. These small box solutions can be used as standalone systems serving one room, but some have the ability to tie into an overall AV and room control system. AMX by Harman’s Enzo enables users to quickly and easily access presentations, photos, videos and other documents to share on a common display. Barco recently announced its Click Share CSE-200, developed for the enterprise requiring enhanced security features or central management. Allowing two users to share on screen at the same time, the CSE-200 can be integrated into the company’s network to enable remote management. Crestron’s AirMedia allows up to 32 participants to connect at the same time in the same room. wePresent allows up to 64 users to wirelessly present mirrored content up to 30 frames per second, in full 1080P HD resolution over an existing network (LAN). As software evolves many collaboration solutions are including the ability to annotate presentations in real-time. Christie Digital’s Brio integrates with Microsoft’s Skype for Business Online (formally Lync) and turns touch panels into shared whiteboard and annotation tools. Depending on the needs of a given meeting space, scalable solutions are available. Kramer@Work is a manifestation of Kramer’s VIA collaboration solution, and its K-Touch cloud-base control system. Utilizing any laptop or mobile device, participants can edit documents together in real time, turn the main display into a whiteboard, instantly share any size file, stream smooth full frame rate HD video, chat with other participants, and collaborate remotely with third−party video conference apps. Mersive’s Solstice enables unlimited simultaneous users to connect to a shared display using a range of devices over a WiFi or Ethernet network. Often used in active learning classrooms, Solstice offers multiple use modes to support both presenter-controlled sessions and ‘equal-access-for-all.’ Live streams of video and other media with synchronized audio, and changes made to content visible on screen in real time are among some of the features. Display manufacturers are no longer providing just a pretty face. Building off its recent acquisitions, InFocus recently announced ConX. The collaboration platform combines the technology strengths of Jupiter Systems and Avistar, to provide scalable, flexible, and affordable solutions. The platform can connect anyone across the globe, from a mobile device to a desktop videophone, computer, video wall, or another videoconferencing endpoint, including the InFocus Monopad. Known for its video walls, Prysm recently announced Prysm Enterprise, a combined hardware and Software-as-a-Service (SaaS) solution that enables real-time collaboration across every size screen — from mobile devices to custom 190-inch video wall. Prysm Enterprise, the newest offering in Prysm's Visual Workplace portfolio, applications, content, video conferencing and the web are combined into cloud-based visual workspaces where anyone can create, edit, share and store work, and re-access the saved workspaces from any location via the cloud. “They” say Millennials are driving the shift to collaborative workspaces. I say poppycock to that. Innovative technologies are enabling students and workers of all ages to be more productive and collaborative. Millennials just happen to the current wave of newcomers to the workforce. Boomers and Gen Xer’s just had to wait longer for these transformative technologies to arrive on the scene. Cindy Davis is a contributing editor of AV Technology magazine.